Funded surgeries for 16 children last year alone. 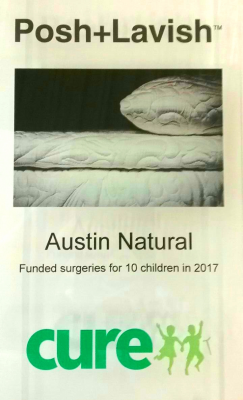 Austin Natural Mattress and Dallas Natural Mattress in partnership with Posh + Lavish donated 25% of all proceeds from the sales of Posh + Lavish to CURE International, and last year alone those contributions led directly to surgeries for 16 children in need. CURE International https://cure.org/ is 100% dedicated to children’s health care. We could not do this without our partners Austin Natural Mattress and Dallas Natural Mattress, and they could not do it without you. Cure allows us all to be Heroes. Helping children survive and thrive through partnerships in training, treatment, and discovery. We have also done work with multiple local charities, including Helping Hands Home for Children, Partner in Literacy for Central Texas Schools, Caritas of Austin, Austin Travis County Integral Care, Family Elder Care, the Make a Wish Foundation, and more. As well as taking part in Eat, Drink, Shop Pink (breast cancer research), donations to entities such as Heal In Comfort (surgical mastectomy shirts), Austin City Ballet and Friends of Oakalla Public Library.